If you think cats came from Egypt, you’re both about a decade out of touch as well as eerily prescient. 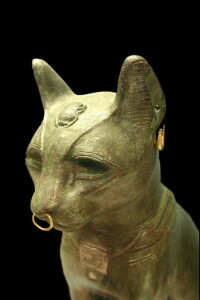 For years, historians believed that cats were domesticated in ancient Egypt. The thinking made sense: The felines are omnipresent in this ancient civilization, from tomb paintings to sculptures to mummies. The Egyptians adored their cats, so much so that they came to consider them gods. But archaeologists burst this bubble in 2004, when they reported finding the grave of a human buried with a cat on the Mediterranean island of Cyprus dating back 9500 years—thousands of years before Egypt existed. Now, a new study has put Egypt back on the map. By analyzing the remains of more than 200 ancient felines, scientists have discovered that there may have been two epicenters of cat domestication: One in Turkey (notably close to Cyprus) around 10,000 years ago, and one in Egypt thousands of years later. At the very least, it appears that by breeding cats on a massive scale, the ancient Egyptians further tamed the cat, transforming it from a territorial and antisocial feline into today’s couch potato. Whether they further refined cats that originally came from Turkey or domesticated their own cats from a local population of wildcats is unclear. Scientists hope to answer this with further research. I’ve written before about how both cats and dogs may have been domesticated more than once. The current thinking suggests that dogs may have been domesticated both in Europe and Asia (and possibly the Arctic as well), and a study published last year raised the intriguing possibility that cats were domesticated again in China thousands of years after they originated in the Near East, though from a different ancestor. If further work does indeed reveal that the ancient Egyptians domesticated cats a second time, it would fuel the idea that the domestication of cats and dogs was somehow inevitable. This makes a lot of sense if you consider why we needed cats and dogs in the first place. Cats, it’s believed, self-domesticated as wildcats slunk into early farming villages to hunt rodents that were feeding on our grain stores. Considering how many places farming arose across the globe, and the wide distribution of wildcats, it’s perhaps not surprising that this could have happened more than once. Likewise, the dog’s ancestor, the gray wolf, lived in many places 15,000 years ago, when it’s thought that dogs first became domesticated. And, like cats, we had a big need for dogs at this time. The Artic study, for example, suggests that early dogs helped us hunt smaller game like deer that came to dominate the landscape after larger animals like the mammoth began to disappear. Soon after, we would need dogs to help guard our campsites and even help us pull sleds—a need that arose in several parts of the world. So, again, it seems plausible that we domesticated dogs in more than one place. Regardless of whether cats and dogs were domesticated once, or many times, domestication was likely a messy process, with several false starts and a few dead ends. But the end result is clear: Our closest companions are now here to stay.